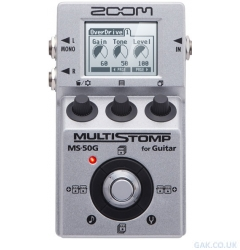 With the size and weight of a typical single stompbox, the MS-50G includes a thorough lineup of high-quality effects types. It features 47 stompbox effects and 8 amp models. Along with distortion, reverb, modulation and other classic effects, its amp models simulate some of the most prized pieces of live and studio gear. an effect, so you can start playing without any hassle.